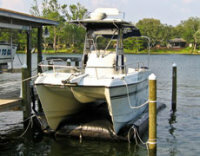 Why an Air-Dock Boat Lift? 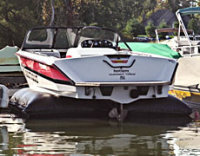 Air-Dock has sold thousands of boat lifts throughout the world since 1999. 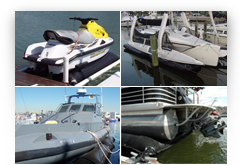 Our inflatable floating boat lifts hoist boats as small as personal water-craft, as heavy as 18,000 pounds, and performance boats up to 51 feet long. A boat hoist will keep your hull clean. Algae growth on the gelcoat of your boat hull not only looks unsightly but can permanently stain the boat reducing its resale value. Algae growth can also reduce your top speed by 10 mph and it will greatly reduce your gas mileage. Read more to learn why the Air-Dock boat lift is a great alternative to mechanical hoists, davits, or antifouling paint. 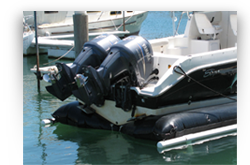 Our inflatable floating boat lifts hoist boats as small as personal water-craft, as heavy as 18,000 pounds, and performance boats up to 51 feet long. If you are considering anti-fouling paint on your boat remember that bottom paint requires the removal of the gelcoat from the boat hull. Also, the anti-fouling paint will need to be re-applied periodically and does not prevent electrolysis. For the cost of several bottom paintings you could purchase an Air-Dock boat lift. ​Read more to learn why the Air-Dock boat lift is a great alternative to mechanical hoists, davits, or antifouling paint. 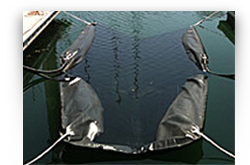 The Air-Dock floating inflatable boat lift is a great low cost solution to hull maintenance problems, especially in shallow or deep water, fresh or salt water. 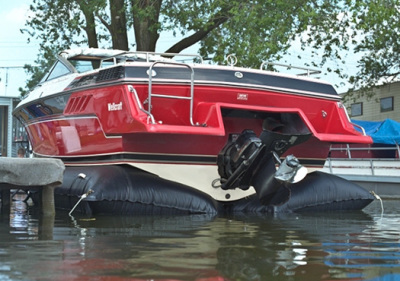 Thousands of Air-Dock customers worldwide are enjoying the verstility, simplicity, and ease of use, of this affordable inflatable floating boat lift solution. A boat hoist will keep your hull clean. Algae growth on the gelcoat of your boat hull not only looks unsightly but can permanently stain the boat reducing its resale value. Algae growth can also reduce your top speed by 10 mph and it will greatly reduce your gas mileage. 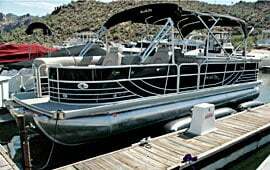 A boat lift will greatly increase the pleasure, pride, and resale value of your boating investment. 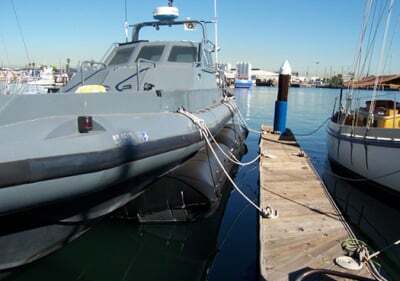 ​Lifts Boats up to 18,000 lb. 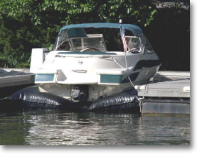 What are the Benefits of an Air-Dock Boat LIft? If you are considering anti-fouling paint on your boat remember that bottom paint requires the removal of the gelcoat from the boat hull. Also, the anti-fouling paint will need to be re-applied periodically and does not prevent electrolysis. For the cost of several bottom paintings you could purchase an Air-Dock boat lift. 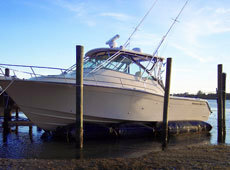 A boat lift will greatly increase the pleasure, pride, and resale value of your boating investment.